I love gardening. The only thing I really love more than gardening is repurposing, which is why this post is so special to me. It’s filled with ideas for repurposing garden tools. So, if you love gardening as much as I do and you want to preserve those gardening tools, this is the post for you. 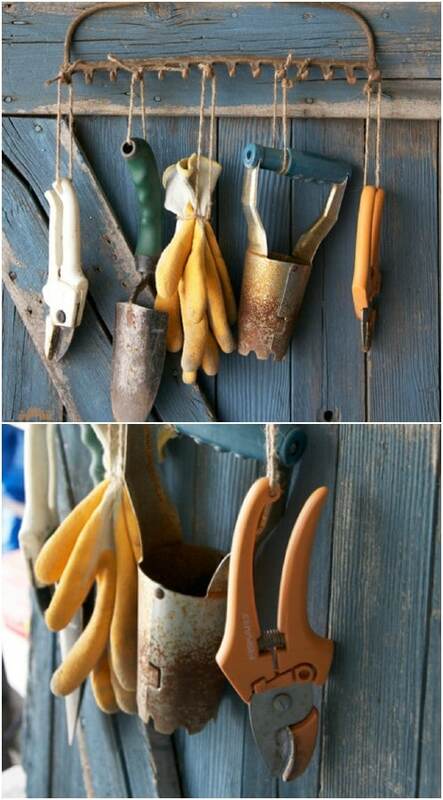 I’ve found 25 wonderful ways that you can turn those old garden tools into new things. From home décor to garden decorations and so much more, I’ll show you some amazing things that you can do with those old garden tools. What I really love about these projects is that they have such a great rustic quality. Old gardening tools are perfect for getting rustic décor. If you have a stash of old tools just lying around then you’re in luck. There are so many things for you to turn them into and most of these projects don’t take much time at all. From birdhouses and garden shed décor to door handles and fire pits, you’re going to love all the things that you can make with your old tools. If you love the rustic look, you should also check out these 55 DIY farmhouse furniture décor ideas. If you don’t have a collection of old tools lying around, don’t fret. You can often find old spades, shovels, and many other tools at flea markets and yard sales. I found old rusty saws at a yard sale for $1 each a few years back and I’m sure you’ll be able to find things just as cheap. And, the rustier the better if you’re looking for a rustic farmhouse appeal to your projects. For many of these, you don’t even have to refinish them. The rust just gives them character. And, be sure to check out these 18 rustic log projects that you can also incorporate into your décor. So, grab those old garden tools and let’s get started. You’ll be amazed at what you can create and I can’t wait to hear how you’ve decorated with your old tools! 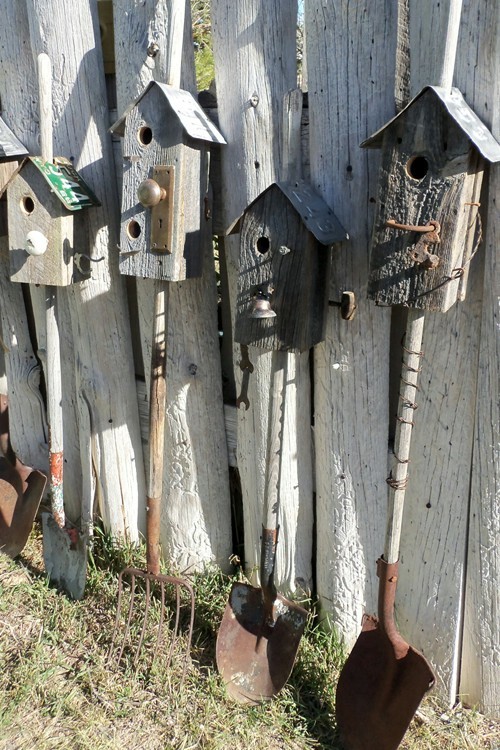 Old rakes, shovels, and garden hoes can be used to create a beautiful little bird city for your lawn or garden area. Just attach wooden birdhouses, which you can buy at any home improvement store, or make yourself, to the tops of those old garden tools and you’ve got a wonderful display for your lawn and a great little place for all of your birds. Who doesn’t love a good fire pit? 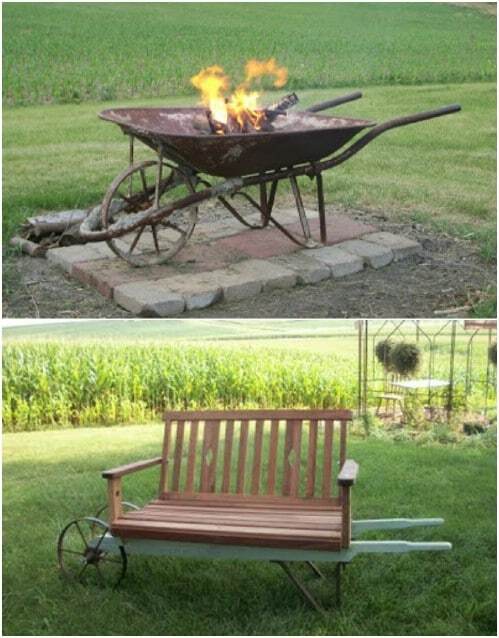 If you do, and you don’t have one, you can turn an old metal wheelbarrow into a lovely rustic looking fire pit and this project takes very little time. Make sure that you’re using a metal wheelbarrow and not a plastic one. Then just add the makings of your fire and you’re all set. You can use an old rake or a shovel to create a lovely garden trellis. Just stick the handle in the ground and then let your vines travel up the trellis. If you have a few old worn out garden tools, this would be a great way to give some support to your beans and tomatoes this year. Or, an old rake looks lovely against a fence with flowers climbing it. Turn an old shovel or spade into a cute little birdfeeder. When you bend the actual tool part up, it makes a wonderful place for you to leave feed for your little feathered friends. 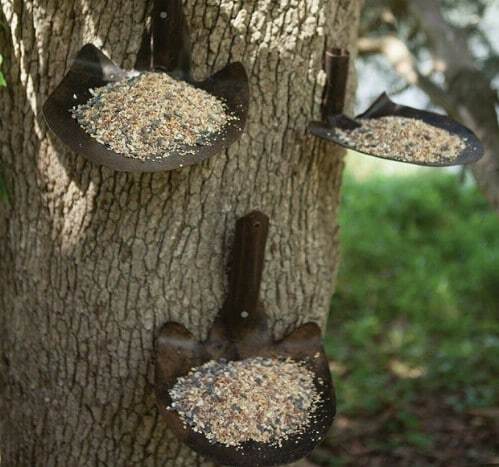 You could add several spade tops to a 2X4 or other wooden base and toggle them so that all of your birds can eat at the same time. 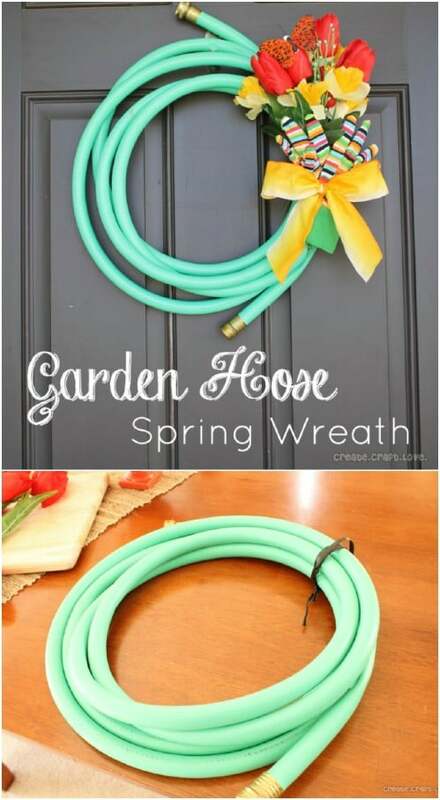 Even that old garden hose can be put to good use when you repurpose it. If you have a leaky old hose that you need to get rid of, consider turning it into this great little door mat instead. This would be perfect for sitting in front of your garden shed door or leave it on the porch. It’s really unique and super easy to make. Plus, it keeps you from having to toss that garden hose in the landfill. I love the look of this gate that is made from old garden tools. Whether you have shovels, spades, or just about any other rusty old tool, you can turn it into this wonderful gate for your garden area. It’s got a nice rustic look to it and you don’t even have to clean those tools and make them look good again. The rust just adds to the gate’s appeal. I love this custom tray that’s made from an old shovel handle. This would be perfect for drinks at your next outdoor dinner party or to hold plants. You need an old shovel handle as well as a rustic old feeder or farm tray. 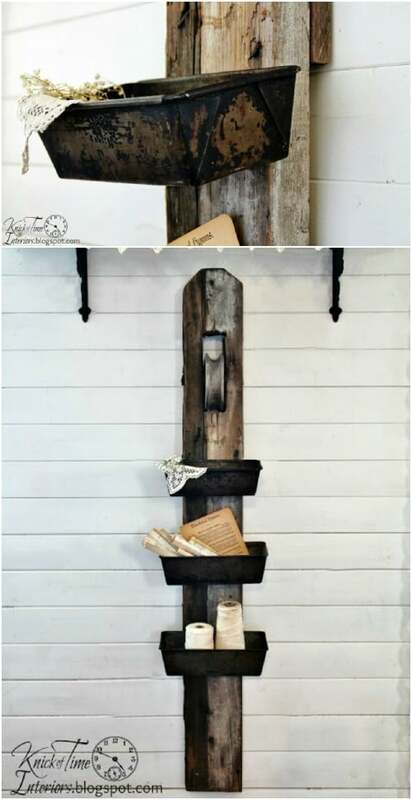 This is such an easy DIY project and makes a wonderful gift idea for anyone you know who loves rustic décor. It would also be the perfect cupcake holder for weddings or parties. If you’re looking for a great repurposing project for old garden tools and you love rustic furniture, these table and chair projects are perfect. Shovels are used for the seats with the legs being made of old tool handles. The backs can be shovels or rakes. The table features a pitchfork leg! I love this for outdoor entertaining. It’s such a unique and functional way to put those old tools to good use. Give your garden area a sophisticated look by adding sculptures that you create from those repurposed garden tools. I love the idea of turning old tools into art. You can use your imagination to create just about any type of sculpture that you want, or you can head on over to Etsy and see what they have available. I found this amazing cat, complete with whiskers, for around $190. If you have a few rusty saws, you can create beautiful flower art for the side of your garden shed or garage or even to hang on a fence. If you don’t happen to have several old saws on hand, you can pick them up at flea markets and yard sales for a dollar or so each. Then create your lovely flower and use a small chicken feeder or something else that is circular to create the center. That old barn pulley that you just don’t need any longer can be turned into an awesome hanging bin. Use rusty loaf pans or something similar to create the bins and attach them to the barn pulley for a great rustic indoor or outdoor hanger. You could also use old chicken feeders for the bins or anything that will hold your items. This would make a beautiful succulent planter for the porch! 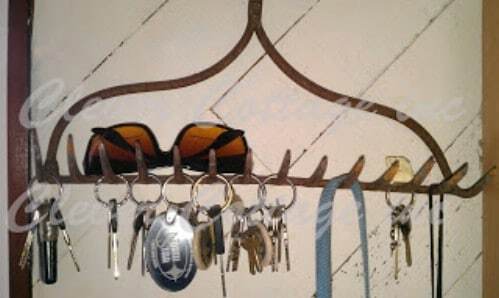 That head off your old rusty rake is perfect for making a key rack or a rack to hold just about anything that you can hang. Put this by the front door to hold keys, sunglasses and other needed items. You just remove the head from the handle and hang it on the wall! You could also paint it if you want but I really think the rusty look gives it much more character. 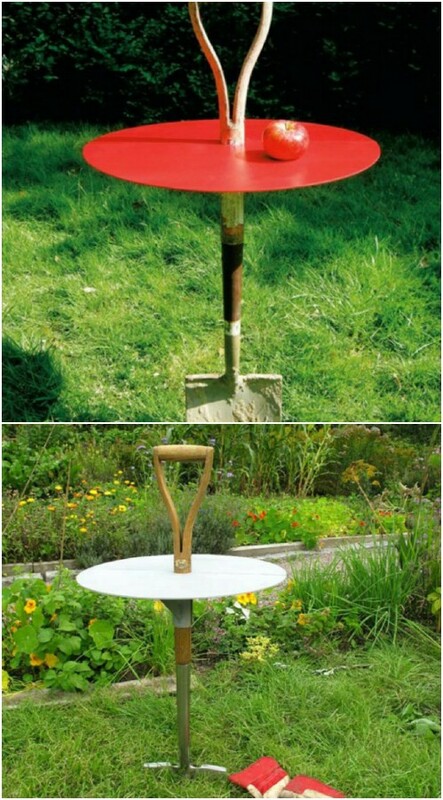 Turn those old snow shovels into this amazing DIY windmill! This entire project will cost you less than $200, and that’s if you have to buy the shovels. If you have shovels on hand, you won’t spend much over $100 for the rest of the supplies. 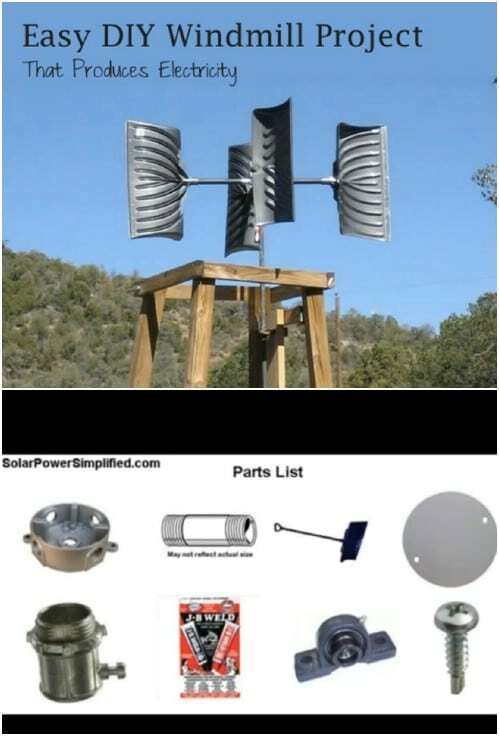 This is an actual functioning windmill that will give you wind power and help you to make your home just a little greener. 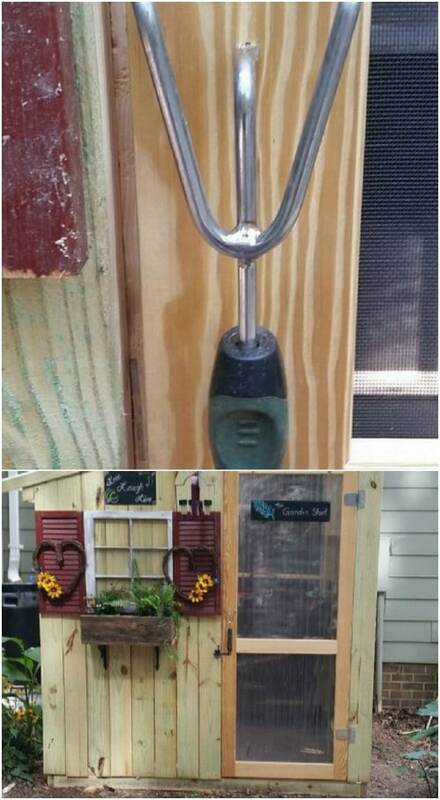 You can easily turn an old rake into a new rack for your other gardening tools. You just remove the handle and hang the rake upside down on the side of your gardening shed or anywhere you need to use it. Twine tied onto the handles of your smaller gardening tools will make them very easy to hang up and you’ll have a place to keep all of those tools organized. 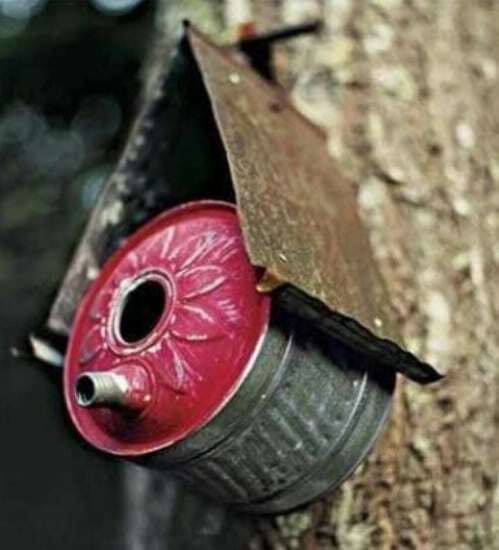 An old gasoline can – rinsed thoroughly of course – can be used to make a wonderfully rustic looking birdhouse. You can use any number of gardening tools to create a nice little birdhouse. Just use your imagination if you don’t have a gas can lying around. You can also use smaller gardening tools to make really unique wind chimes and any number of other great outdoor décor. 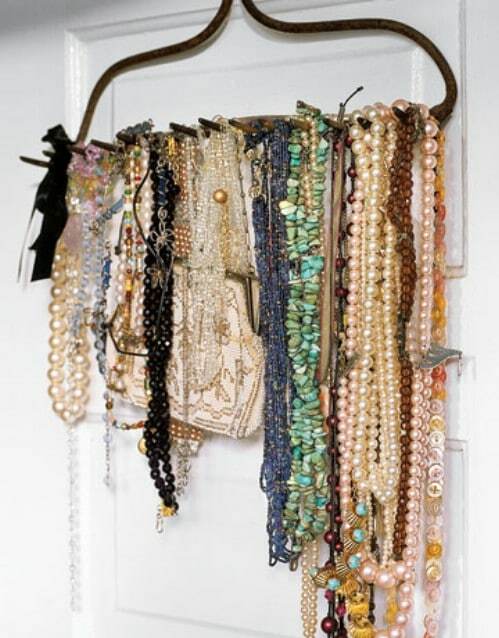 Organize those necklaces in a great rustic way with an old rake head. Remove the handle and hang the rake head up on a wall or the side of a dresser. It gives you plenty of room to keep necklaces and scarves organized and keeps jewelry from getting tangled by hanging it up and out of the way. An old – or new – shovel can easily be turned into this amazing gardening table that you will be proud to showcase on your deck or porch. You just need to cut a circular piece from wood, metal or plastic and attach it to the handle toward the top. You can then “plant” the shovel anywhere in the yard or even use a larger planter to keep it upright on the porch or deck. I really love this old leaf rake turned photo holder. It’s so simple to make, too. You just remove the handle from your rake head and use the head to display your favorite photos. The head can be mounted to a block of wood to keep it stable and you can stick your photos up using tiny clothespins that you can pick up at any craft or hobby store. A smaller yard rake can be used to create the handle for this lovely planter box that you can build from scratch. You can use scrap wood to build the tote box, which makes a stunning planter. The small rake or other small gardening tool is used for the handle and the entire project is a beautiful as it is easy to build. 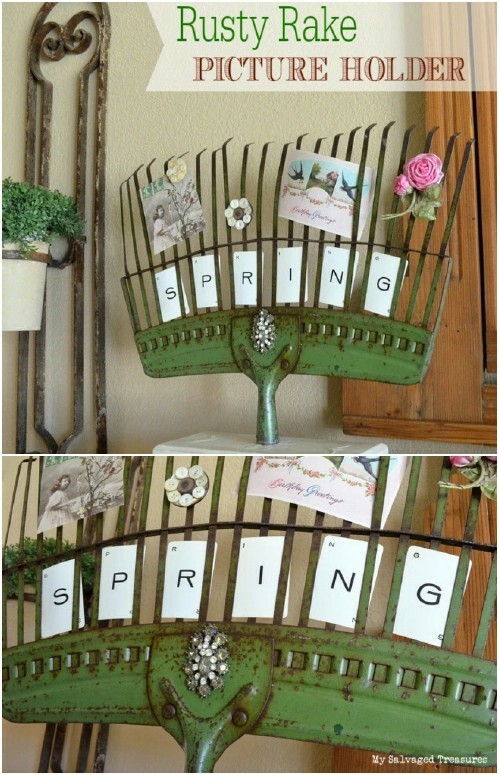 Here’s another amazing way to put an old rake to good use. 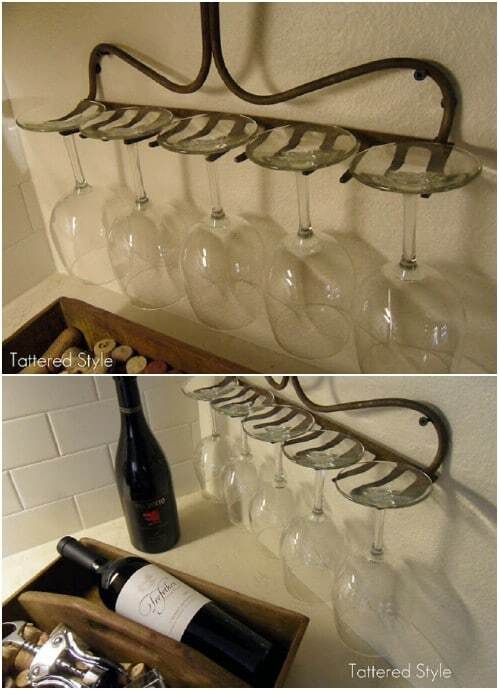 Use it to hang and display your wine glasses. Just remove the handle and hang the rake on the wall. Wine glass stems slip perfectly between the tines, making a very rustic wine glass holder. You can sand and paint the rake if you want or just remove the rust – so it doesn’t get on your glasses – and hang it as it is for a really great rustic look. Do you need a neat new handle for your garden shed door? Why not use a small garden tool? A trowel or any other small tool will work perfectly and there’s really no prep involved. You just screw the tool onto the door and you’re all done. You could use larger tools – shovels, etc. – for barn doors or larger sheds, as well. 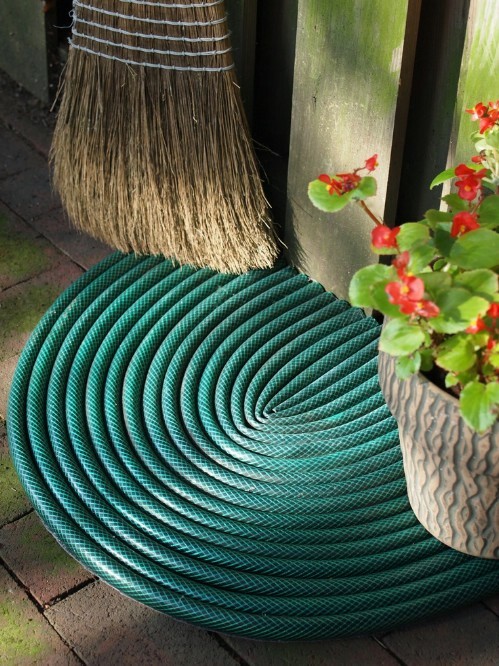 An old garden hose that has sprung a leak doesn’t have to be trash. You can turn it into a lovely wreath that is perfect for adorning your front door throughout spring and summer. This is so easy, too. You just roll the garden hose up and clamp it together and then add some sort of seasonal decoration like flowers and some brightly colored gardening gloves. 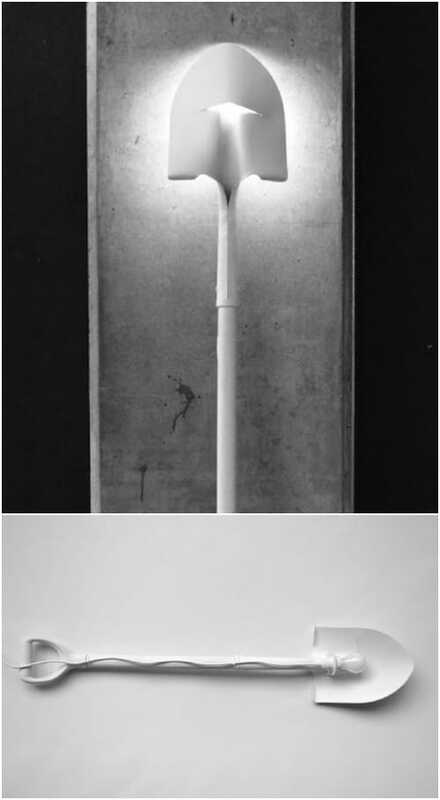 This shovel turned floor lamp is genius and the perfect way to add a bit of rustic charm to your décor. This really isn’t a difficult project. You just finish the shovel however you want – sand to remove rust and then paint – and add your light. You’ll need to attach the light bulb so that it won’t fall off and decide if you want to hang or stand your new lamp. 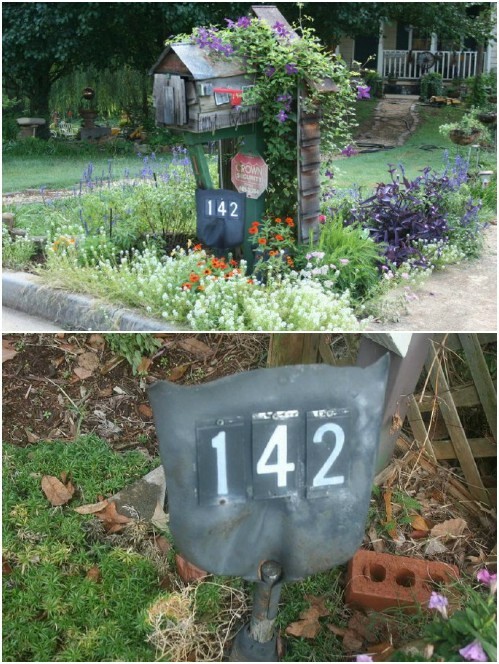 What better way to use an old shovel head than to turn it into an amazingly rustic address marker? I love this idea and it’s really simple. 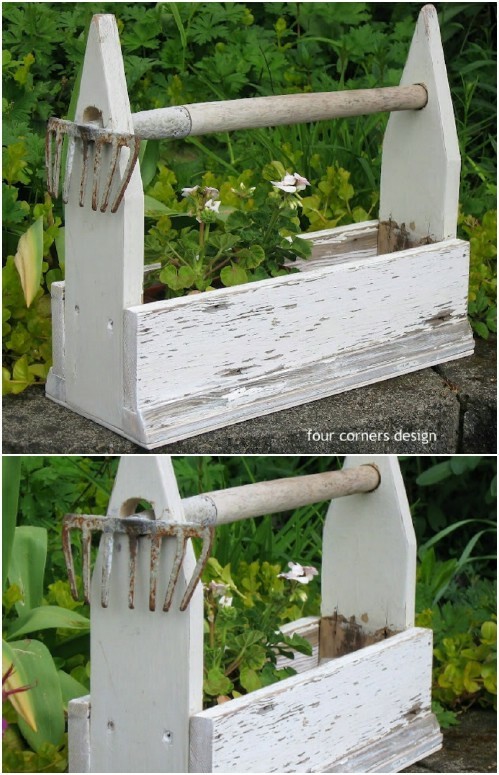 Just decide if you want to paint the shovel or leave it old and rustic. You just paint your address number on the back of the shovel and then “plant” the handle into the ground to make it stable. So easy and it offers such a wonderfully unique look.